"The units that we have installed work perfectly and are everything that you advertised." "I prefer your dispensers at the schools that we experience vandalism even to the "free" models some manufactures offer." Public schools pose a unique challenge when it comes to vandalism and if not kept in check, can cost a school tens of thousands of dollars over the years. Schools are challenging in part because a select few students make it a point to cause problems just for the sake of a few cheap laughs. Search YouTube for Vandalism and one will find video after video of kids themselves destroying public property for their own or their friends amusements. The irony is that these same students depend on these very facilities they are destroying for their use. 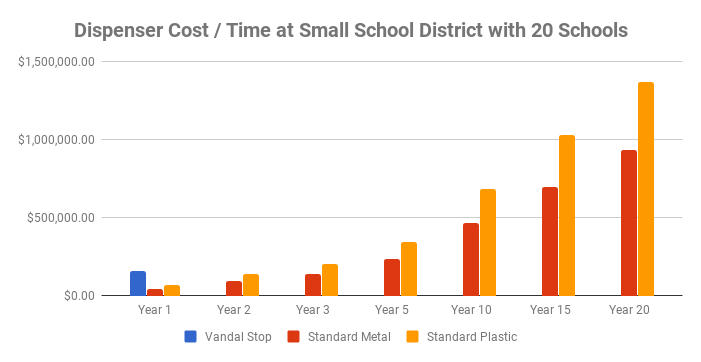 With school budgets stretched as thin as they are, the additional cost of vandalized school bathrooms often means cutting the budget elsewhere to fund repair of broken restrooms. The key to keeping the maintenance costs in check is to prevent vandalism in the first place. Vandal Stop Products has been selling to school districts for nearly three decades now. We have talked first hand to the maintenance personnel responsible for repairing vandalized facilities and from that, we have developed a line of toilet paper dispensers, soap dispensers, paper towel holders and mirrors that are able to put a stop to vandal attacks. We do this first with our industry leading use of 12 gauge stainless steel material that gives us an unmatched edge in product strength. We then equip our products with heavy duty locking options to ensure that dispensers cannot be easily broken into. Finally, we specify the use of 3/8" mounting hardware at multiple points to ensure that even size nine sneakers can't kick the units off of the wall. The result is a bathroom dispenser that is so rugged that vandals are deterred from causing expensive damage to your school facilities. What is better, the savings can add up huge over time! The chart below shows the possible savings over a 20 year period can be as much as $6,800.00 for just one bathroom stall. If your school has on average 4 stalls per bathroom and 8 bathrooms scattered around campus for the students use, that is a total of 32 stalls and a potential theoretical savings of $217,000.00. Apply that savings across an entire school district with say 7 schools the total theoretical savings could be as much as $1.5 million dollars in savings. Your particular school or school district will have it's one unique savings that may be more or less but the point is that after the one time initial investment is made, your schools can stop spending money on costly repairs.